SAAV is the most advanced ShapeArray model to date. Inspired by direct feedback from clients, Measurand developed a new installation method unique to the SAAV that allows the ShapeArray to be installed directly into existing conventional inclinometer casings or narrow conduit. SAAV is ideal for retrofitting ShapeArray instrumentation into existing conventional inclinometer casings or for new installations in ungrooved casings or conduit. 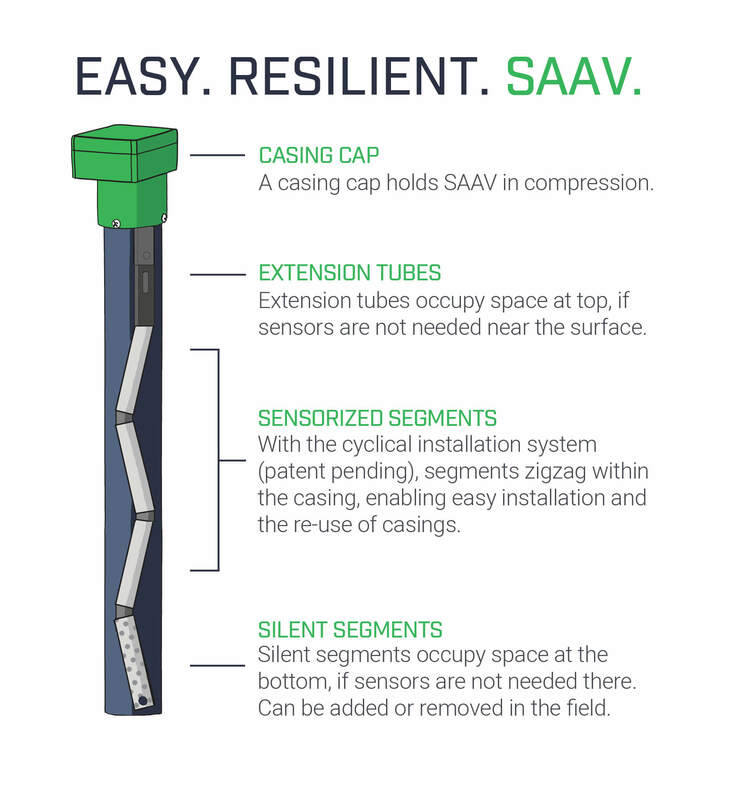 SAAV’s off-the-reel cyclical installation system (patent-pending) inserts the ShapeArray in a zigzag pattern into casings from 47 mm to 100 mm internal diameter (ID). The SAAV is then locked into place with a custom-designed spring box assembly. However, with a simple conduit adapter, SAAV can also install into 27 mm ID conduit, giving the client the flexibility to install SAAV in a manner that suits the project requirements. For situations where the SAAV is not required to reach all the way to the bottom of the casing, we offer silent segments for SAAV. Silent segments have no sensors inside and are connected at the far, non-cable end of the SAAV to increase the total length of the array. This innovation is useful when SAAV is installed into existing casings where the shear zones are known to be well above the bottom of the hole or to accommodate for casing depths that are not well known at the time of order. SAAV contains upgraded MEMS sensors that reduce power consumption and improve resolution. SAAV is available with 500 mm segment length segments, up to 150 metres long.